Chris Kent has finally made it to YouTube! For a number of years I’ve been recording piano tracks for various artists at Bill Filer’s studio, and one guy who’s given me a lot of work and credit, and has always been a pleasure to record with is Chris Kent. His songs are intelligent and humorous, and his meticulous attention to detail is always guarantees a great recording. For this project he pulled out all the stops, enlisting some of State College’s top musicians to get everything right – which you can hear in the recording. There’s jazzman Steve Bowman on saxophone, smooth-as-silk Pete Jogo on bass, Grammy-nominated Jack Wilkinson on drums, and the legendary Andrew Jackson on congas. Plus, Chris called up some of the best voices in the area to be his choir: Kate Twoey, Trace Baker, David Whitmer, Stacy Tibbets, Ray Najjar, Morgan and Margaret Higgins, Linsdey Lane Lorefice, and Lynn Yost. 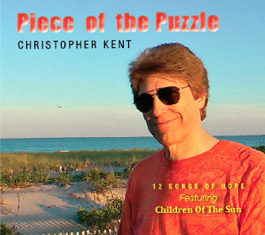 The song/video “Piece Of The Puzzle” is actually just one part of a larger project which ties together a 12-song CD and a book, “Staying Off The Wheel Of Misfortune.” The book’s pretty cool, nicely written and full of great advice that’s hopefully going to help keep me away from a bad ride.